The College of Arts and Sciences is the largest school at the University of Oklahoma with 28 departments, 50 majors and over 7,000 students. The large student population results in numerous requests for services such as changing majors and class withdrawals that must be processed by the Academic Services Office daily. Here is how Laserfiche automated the management of student records and processing of petitions and forms. The Academic Services office handles more than 8,000 student records for both active and inactive students. Each record can range anywhere from ten to 100 pages and include the student’s entire academic history including high school and college/university transcripts, advising documents, email correspondence to and from the student, degree checks and disciplinary paperwork. It is very important that these records are only accessed by authorized staff members. All student records are now stored in Laserfiche. 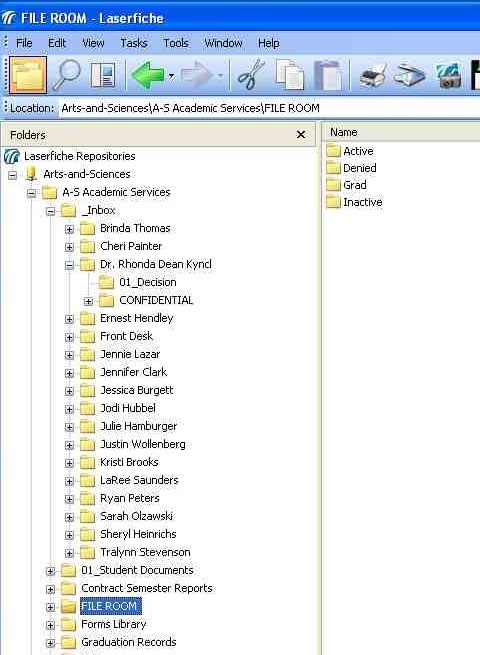 The “File Room” folder in the Laserfiche repository stores records for active, denied, grad and inactive students. 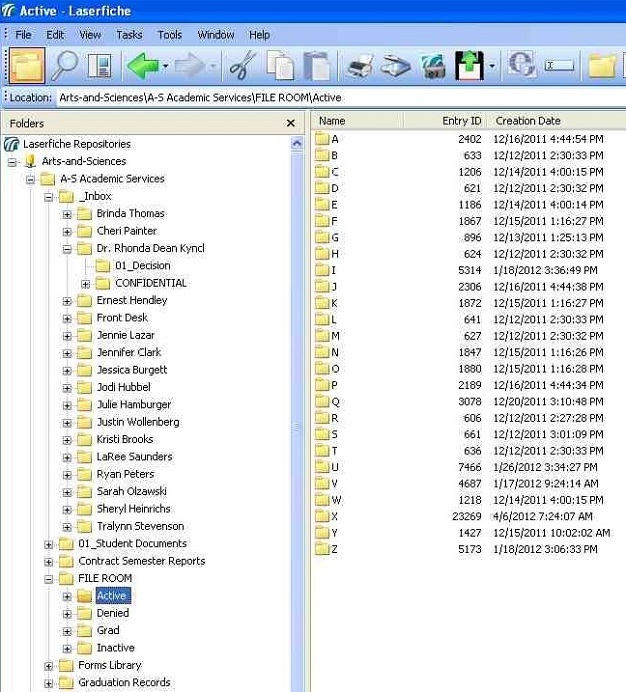 Each counselor has her own “Inbox” folder in the Laserfiche repository where documents needing her attention are placed. Students change their major three times on average during their academic career. They can only change majors if they have an acceptable GPA. If the GPA falls below a certain level, then they have to get approval from one of the counselors. If it falls below another level, they need to seek the approval of the assistant dean. 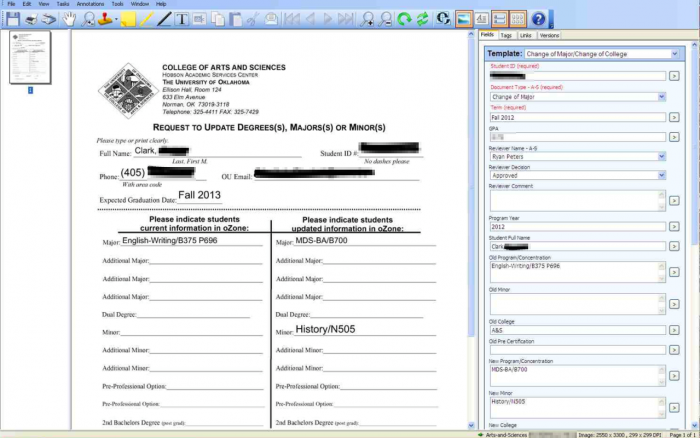 Laserfiche has fully automated the change of major request process at the College of Arts and Sciences. A student comes to the Academic Services Office and a receptionist fills out the change of major PDF form with them. This form is then sent to Laserfiche with Laserfiche Snapshot and certain required fields are manually populated. 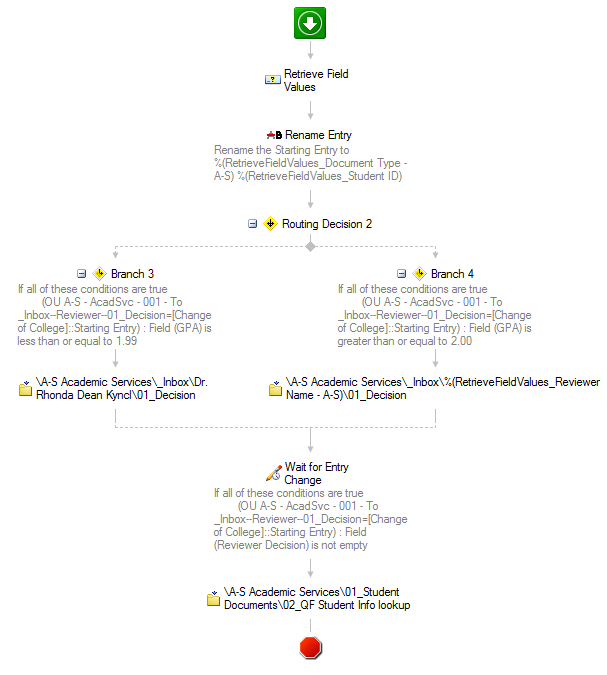 A workflow is then invoked. If the student’s GPA is below 2.0, a short-cut to the Change of Major form is sent to the Assistant Dean’s folder. 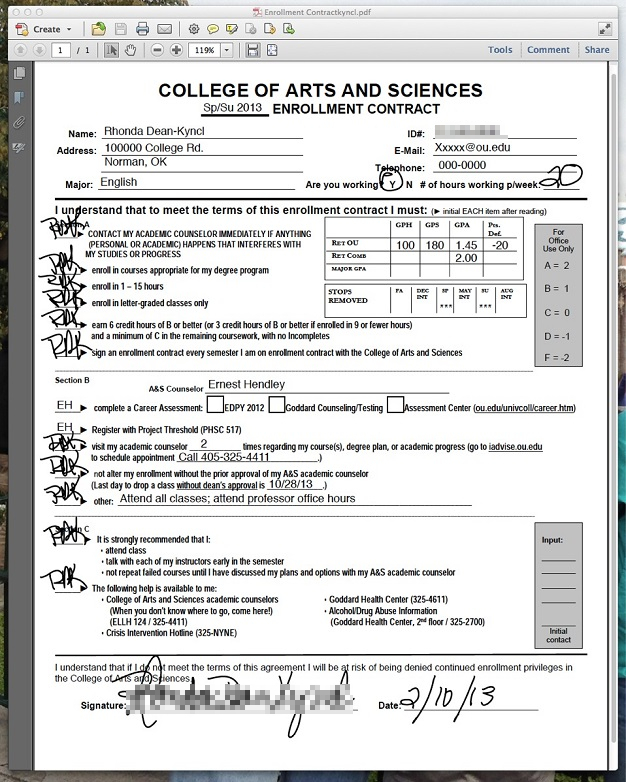 If the student’s GPA is greater or equal to 2.0 a short-cut to the form is routed to the assigned counselor’s folder. Either the Assistant Dean or the counselor reviews the change of major request and approves or denies it by changing the value of the “Reviewer Decision” field. Once reviewed, the document is routed to a special folder in the repository where it awaits processing by Laserfiche Quick Fields. 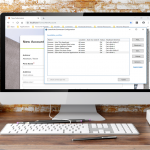 Laserfiche Quick Fields looks up information in the Banner Student Information System database by Student ID number and populates the rest of the document’s fields including name, term of entry, birth date and enrollment information. It is no longer necessary to obtain this information from the student, as it is always up to date based on what is stored in the Banner Student Information system. This process is similar for other requests such as complete withdrawals, admission referrals and graduation and minor clearance. If a student at the College of Arts and Sciences has a GPA that falls below a certain level, the student is placed on academic contract. This means that the student is at risk for being suspended from the university or dropping out because of poor performance without graduating. Students placed on academic contract are required to meet with an academic counselor at least once a semester, meet several strict guidelines to remain enrolled in the college and to make progress toward and eventually achieve an acceptable GPA. This previously paper-heavy process has been revolutionized with Laserfiche. Students are now informed of their academic contract status by email. A copy of the email is stored in the student’s Laserfiche folder. The academic contract itself is electronic. The counselor reviews this contract with the student on an iPad and the student signs the contract with their finger or a stylus. A copy of the signed contract is then emailed to the student. The College of Arts and Sciences is in the process of implementing mobile advising. Counselors will now be able to meet with students outside of the office, such as in a dorm meeting area, and not have to rely on students coming to them. Laserfiche Mobile will grant counselors immediate access to the student’s records directly on their iPads. Implementing Laserfiche in the University of Oklahoma College of Arts and Science Academic Services Office has resulted in the following benefits. The office saved $1,800 a year by eliminating the File Trail hard copy file management system and reducing the purchase of paper and supplies. Academic contract status, honor roll and other notifications are now sent by email, saving the office $1,080 a year. Advisors and staff are more efficient as multiple people can access the same student record simultaneously. 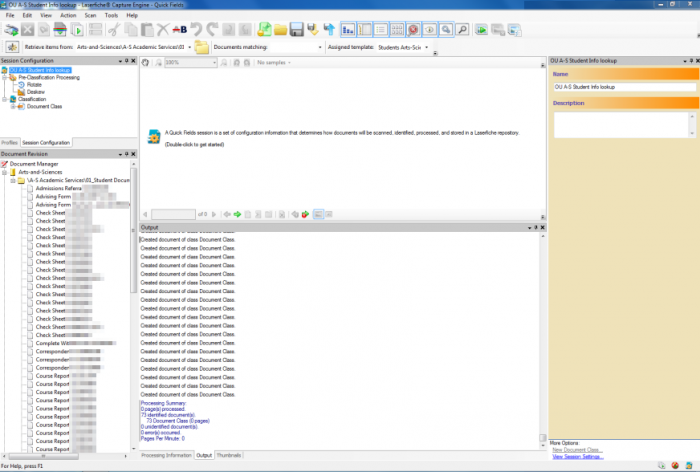 Processes are automated so that emails don’t have to be typed manually. Student forms and documents are no longer misfiled. An advisor can see all the student records at a glance by simply opening the student’s folder in Laserfiche.